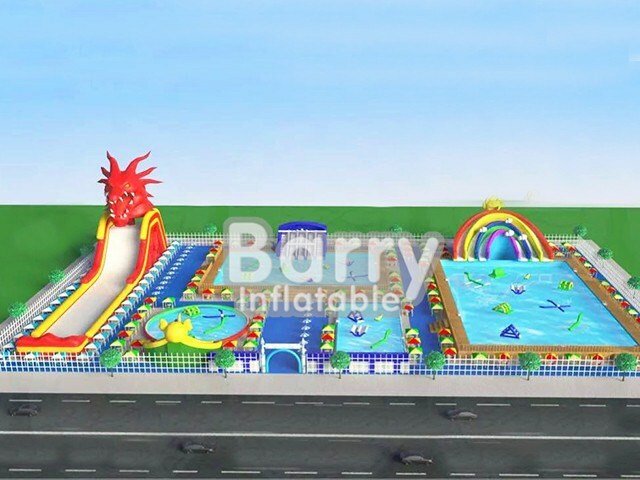 Amusement Water Park - According To Site Design Inflatable Water Park Inflatable,Play Park Kids BY-AWP-094 - Guangzhou Barry Industrial Co., Ltd. If you want to plant to open a giant inflatable amusement park,contact Barry now!All kinds of ours will be hit!!! The giant amusement park is composed of rainbow inflatable slide metal frame pool,giant dragon water slide.And all size of the each product can be customized as your area with our designers' help. We offer totally free 3D design as a blueprint for your reference, you just tell us some necessary information about your project, our experienced designers will work it out perfectly as you demanded. Our persuit is to make your Resorts or Parks much more amazing,funny,attractive and impressive. Of cause, Safety Play is NO.1 Priority. Q1：What's the elements and size?